Editor's note: Churches are encouraged to designate a Sunday in May as Older Adult Recognition Day. Here's a story of just one of the many outreach ministries in the Florida Conference that could never happen without older adult volunteers. Click here to see a related story. ARCHER -- It’s a familiar story, especially in rural Florida: Time and circumstance whittle away at a once-bustling congregation, leaving fewer – often aging -- hands to do the Lord’s work. Children grow up and relocate to metro areas where they can find good-paying jobs. As their parents retire and grow older, many decide to move as well, seeking the care and companionship of their offspring. A small but mighty congregation worships in this historic "little church on the prairie" in rural Archer. Florida Conference file photo. 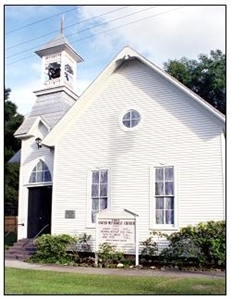 And so it has been with First UMC, Archer, a picturesque “little church on the prairie” that Margaret Jones of Gainesville discovered about 20 years ago when she spied the cross and flame on a sign by the highway that goes to Cedar Key. She and her husband had recently moved to the area, and she had been visiting larger congregations in search of a church home. She fell in love with Archer, a congregation then of about 150, including families with children. Since then, it has diminished considerably in size but not in spirit. Last year, the congregation embarked on an outreach ministry to help feed senior citizens living in a nearby apartment complex. Jones, now 74, coordinates the ministry, known as Loaves and Fishes. A committee meets early in the year and plans out menus, sets up a rotation schedule for packing and delivery, and makes other decisions so that volunteers can provide one meal a month for 19 people all year long. Most volunteers are in their 50s, 60s and 70s. “If you didn’t show up for the committee meeting, you got December,” Jones quipped. The meals go to individuals who are mostly in their 70s or older, many of whom receive Meals on Wheels during the week. But that organization doesn’t deliver on weekends. After some trial and error, the committee decided only nonperishable foods would work. But the church wanted the meals to be wholesome. That was challenging for Jones, who has a background in nutrition and usually pushes fresh food. “I’m having to relearn that a can (of food) can be a good thing,” she said. 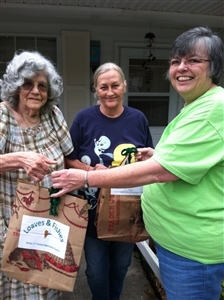 Left to right: Patricia Walton and Carolyn Hogsett receive meals from Rev. Priscilla Scherrah, pastor of First UMC, Archer, as part of the church's Loves & Fishes ministry. Photo from Priscilla Scherrah. So far, the favorite at the retirement village is canned chicken and dumplings, mixed vegetables, peaches and a treat, Jones said. Volunteers shop, put the items in bags and bring them to the church fellowship hall. Jones and Pastor Priscilla Scherrah put together a little newsletter of nutrition tips, instructions for cooking the meal if needed and an offer of prayer. Delivery occurs on the fourth Friday of the month, and that can be the hardest part of recruitment because many of the volunteers are still in the workforce, Jones said. Spiritual nourishment is as important as the food, said the church pastor, who is a mainstay among delivery volunteers. “We pray with them and ask them if they have any concerns or anything they need help with,” she said, adding that sometimes the church can help with overdue power or water bills. Volunteers and visitors alike know each other by first names, and Scherrah even knows the names of the residents’ pets. Ministry participants often slip food for the cats and dogs into the bags. Sometimes the biggest need is comfort in a time of crisis. Scherrah recalled a man who shared some bad news he received from doctors about his health. “We prayed with him, and he ended up going in the hospital,” Scherrah said, adding that he died shortly afterward. Since the ministry began, Jones said, the church has received thank-you notes from recipients expressing how much the effort means to them. Two people on the list started coming to the church. But Jones said church members reap the greatest rewards.